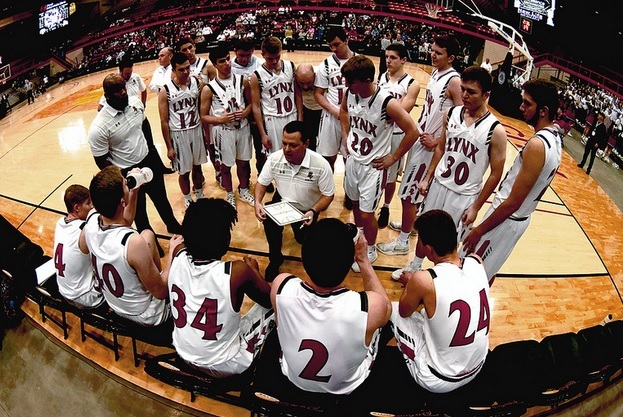 The Brandon Valley Lynx punched their ticket to the Boys Class AA Championship game Friday. RAPID CITY, S.D. - The Rapid City Stevens girls basketball team rebounded from an opening round loss to roll over Sioux Falls Washington 62-38 in the consolation semifinals Friday. Stevens jumped out to a 13-5 first quarter lead and never looked back, outscoring Washington 25-6 in the second quarter, 18-8 in the third and 14-11 in the fourth. Stevens was led by Cameron Carley's 14 points. Grace Martin and Jayda McNabb each added 10 points. Stevens will play Sioux Falls O'Gorman in the consolation final Saturday. O'Gorman earned their trip there by beating Brookings 61-41. Brandon Valley will meet Sioux Falls Lincoln for the Class AA Girls Championship. Brandon Valley beat Mitchell 52-38 to earn their trip to the championhip game while Lincoln edged Harrisburg 42-39. On the boys side, Rapid City Stevens couldn't overcome the Sioux Falls Lincoln Patriots in the consolation semifinal. The Patriots made enough free throws down the stretch to pull away for a 74-67 victory. Dylan Pourier had another fantastic game for the Raiders, scoring 26 points. Stevens will play for sventh place Saturday against Huron, who fell to Sioux Falls Roosevelt 68-52. In the Boys AA Championship game, Brandon Valley will play Sioux Falls O'Gorman. The Lynx beat Harrisburg 53-40 to earn their trip to the big game while the Knights just got past Yankton 43-42.